Bond Ladys Corner » NEWS FROM IRAQ » Iraq Dinar & CBI News » Central Bank reveals to "NAS" details of the project "Structuring the currency"
The Central Bank of Iraq revealed on Monday details of the project "Structuring the currency", which aims to delete 3 zeros, to facilitate the circulation of currency. Since this is not a redenomination, the rate would need to change for the large notes to be removed from circulation due to the impracticality of their size. IMHO, this is a critical project to watch. Shredd wrote: Since this is not a redenomination, the rate would need to change for the large notes to be removed from circulation due to the impracticality of their size. IMHO, this is a critical project to watch. Thanks Shredders ! And thanks ikea for bringing this in ! I couldn't agree more. 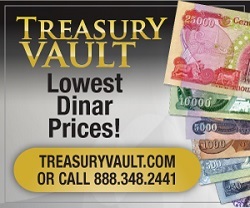 Currently 1 dinar is worth 0.0008397 USD so the rate would have to change !!! 4 Re: Central Bank reveals to "NAS" details of the project "Structuring the currency"